When I was a little girl, there was a hill behind our house, filled with clover flowers. Daily I would go outside and run along the hill, chasing butterflies. I would worry my mother for a jar, punch holes in the lid, sprinkle grass in the bottom, to make a home for the butterfly I would catch. I wanted it to be comfortable in its new home, did not want to shock the butterfly too much, having taken it from its true element. I wanted to admire the butterfly, and so I needed it to be comfortable. I absolutely loved these fairy like creatures. As anyone knows, butterfly wings are very delicate, paper thin, like rice paper. When I would capture one there was a powdery like residue left on the tips of my fingers. The oil on my tiny fingertips removed the color and pattern of the butterfly wings. I also believe now that the oil created a heaviness on its delicate wings possibly impeding the ability of the butterfly to take flight again. Of course, I would catch them very gently, I did not want to harm, only to contain, admire and adore. However, already I was altering the beautiful butterfly. At other times when I caught one in my excitement, I might chip or break a wing and again the butterfly would lose its ability to fly. I did not realize the damage I was causing and the imbalance it created. I did not fully understand, how my desire to own it, and removing it from its element, actually was the beginning of its death. Caging it in a glass jar with no room for flight, without flowers or sunlight, was a sure death sentence. But as a small girl with no real understanding of Eco systems, I was only thinking of my delight and the pleasure I found in the chase and capture of this exotic creature. The creature whose wings carry rainbows to oil slicks, and whose lighting on flowers pollinates them, and whose wing flutter in the winds can create or stop a wind storm. Yes, this tiny, magnificent, powerful creature! I loved their lightness of being and how swiftly and gracefully they would flit from flower to flower. I was intrigued and my only thought was to capture one! This elusive, beautiful, magnificent fairy like being. I was the butterfly. The butterfly was my call to ascend, to becoming a lighter, elevated spiritual being, having already been consumed by the denser, heavier, base energies of a disconnected culture and the earth man. I wanted only to love one, wanted it to be mine. 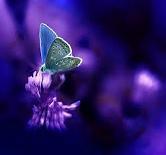 The butterfly was ethereal, mesmerizing, appearing unobtainable, light, swift and free. My play days were consumed with its' flight, which was my fancy. 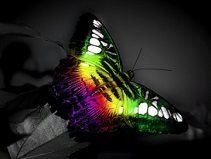 I believe on a subconscious level, there was a knowing in me regarding the butterfly and its relationship to my spirit. I was the butterfly, I would be the butterfly, I would study it, learn it, know it, become it. As the Chinese proverb says: One must study and become the thing they would aspire to create." I found my soul in the spirit of the butterfly. My desire to capture and contain it was my lack of understanding regarding freedom, for in order for anything to be yours it must be free. To have it you cannot contain it; only allow , always allowing. This concept had not entered my less sophisticated knowing as yet, but I fully understood wanting to be free and the joy I experienced in being spiritually awakened in the presence of the elusive butterfly! The moral of the story is: In life we see what we want, we chase it, we try and contain it, we make it our own because we believe we should have it, why not? Giving no thought to the repercussions of how our desire may damage the innocence and beauty of the thing we want most. Our lack of awareness due to passion and desire clouds our ability to see. Removing what we desire from its element and attempting to make it serve us is the undoing of it. Placing it in our jar, or displacing it does not make it ours. What does occur is that object we most desire loses its' essence and as a result we will not have what we are chasing, and the object we desire loses its essence because it cannot survive the trauma of Not Being! Whatever your butterfly is, free it and I am certain its' spirit will bless you with its' return, in its' full majesty and true essence.